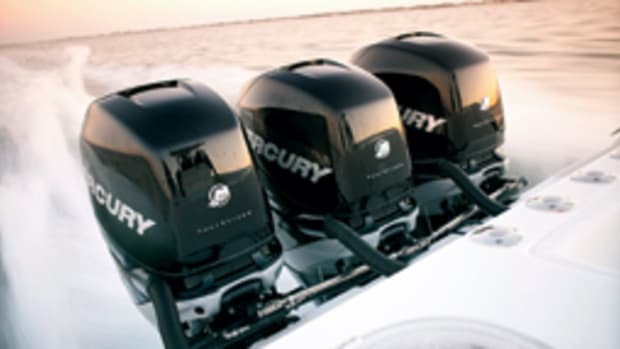 In the 4-stroke outboard race, we&apos;ve seen incremental horsepower increases of 25 and 50 as manufacturers push out new products. For instance, Yamaha&apos;s F350 in 2008 overtook 300-hp models from Suzuki and Mercury. 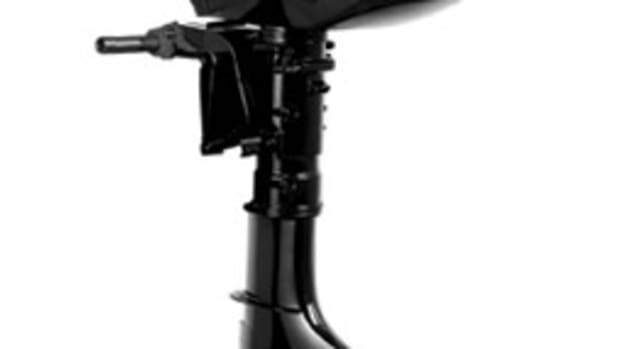 Well, a new outboard - and it&apos;s not from a household name - has surpassed the 350 mark by a whopping 207 horses. 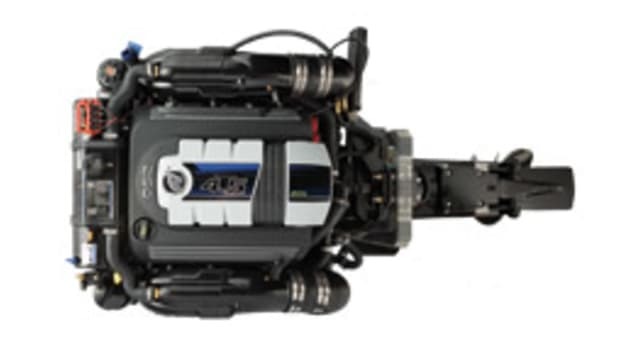 The newly formed Seven Marine has taken a 376-cubic-inch General Motors engine used in the Cadillac CTS-V and turned it into the highest-horsepower production outboard - the Seven Marine 557. 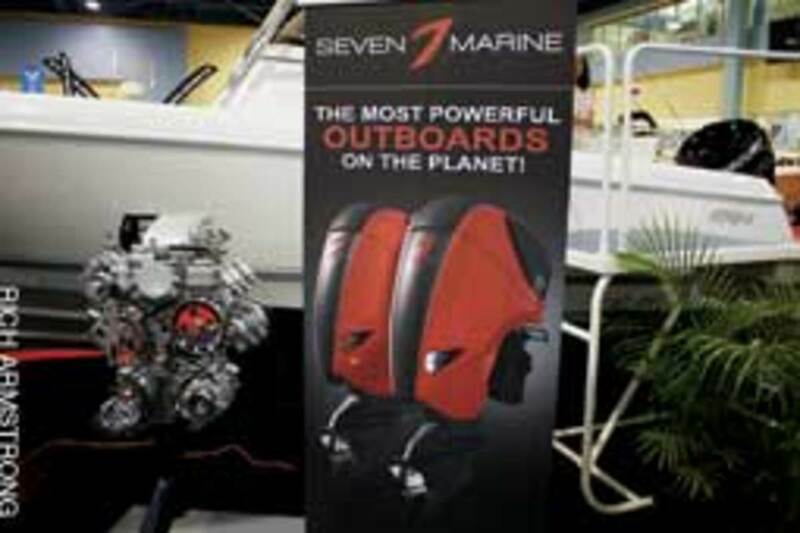 Headed by former Mercury Marine engine expert Rick Davis, Seven Marine had a pair of its engines hanging from an Intrepid 370 Cuddy at the Miami international Boat Show in February. 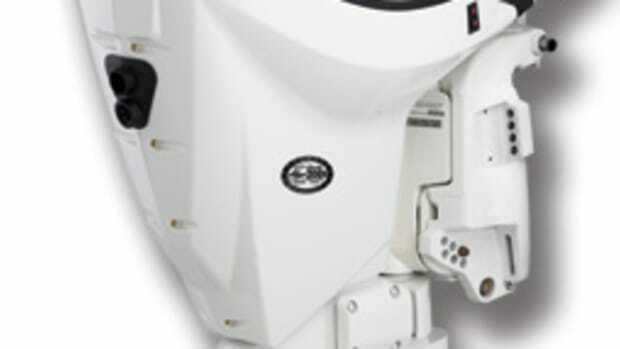 The twin 557-hp outboards could push the boat to 80 mph or faster, the company says. So much for throttling back to save fuel. "We&apos;re pinching ourselves, and we love the fact that you don&apos;t have to be a Mercury or a Yamaha to do something cool in the marine industry," Davis says. "[Mercury and Yamaha] have fantastic products, but we wanted to do our own thing." 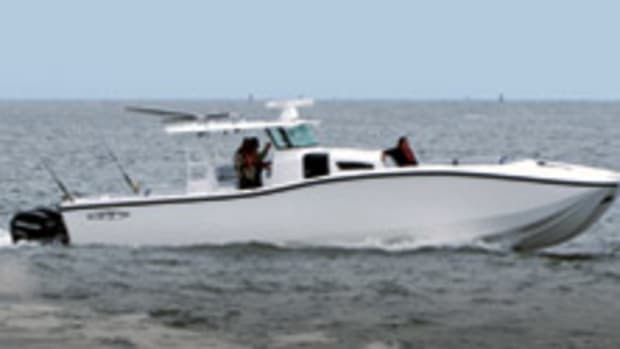 The 6.2-liter Seven Marine engines were linked to ZF Marine&apos;s Joystick Maneuvering System, making the Intrepid the first production-built joystick-controlled outboard boat. The 1,000-pound aluminum outboard, which uses a marinized General Motors LSA small-block V-8, packs a slew of technology and functions that consumers have been requesting, Davis says. "You expressed the desire for more power," Davis said during a press event at the Miami show. "We responded with a 557 supercharged horsepower [engine]. You asked for smoothness and torque. We delivered a thoroughly refined V-8 with 550 foot-pounds of torque. You requested a higher top speed. We have reduced the gearcase lower-unit drag. You asked for a lower unit that was tough enough for the offshore market. We built a patent-pending, twin-pinion through-hub gearcase. You requested a new approach to outboard control. We use the [ZF Marine] Smart Command Controls with the JMS joystick." The JMS is linked to the ZF Marine CAN-bus controlled disc-clutch transmission and a ZF bow thruster. Another innovation is the 557&apos;s closed cooling system - a first for the outboard industry, Davis says. Mequon, Wis.-based Seven Marine consists of 10 employees, including Davis&apos; two sons, Brian and Eric. The concept of developing the most powerful production outboard came from Eric Davis. "It was Eric&apos;s dream, and it took a little convincing for me to get my head around it because of my paradigms of building outboard motors that were smaller than this," says Rick Davis, who had been chief technology officer and vice president of engine development at Mercury. The engine&apos;s torpedo lower-unit design and size are similar to the 300-hp Mercury Verado and Bravo I sterndrive, Davis says. Seven Marine elongated the torpedo just enough to add a double-pinion arrangement, which allows the shifting to take place out of the water, he says. 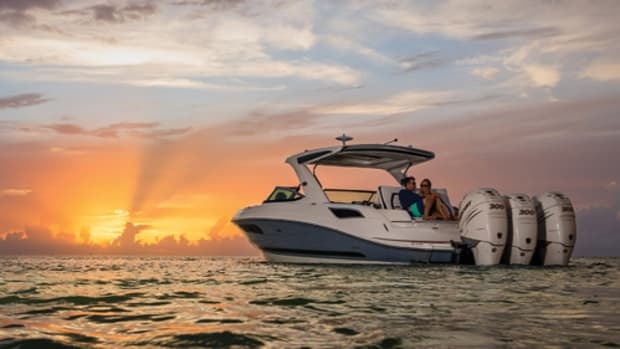 The 557 enables a boatbuilder to deliver more horsepower with fewer engines - and the drag of their lower units - which equates to improved efficiency, Davis says. The engine can be used in repowering applications, and its weight should not be a problem. "We will be putting twins where usually there are triples and quads, or singles where there are twins," Davis says. 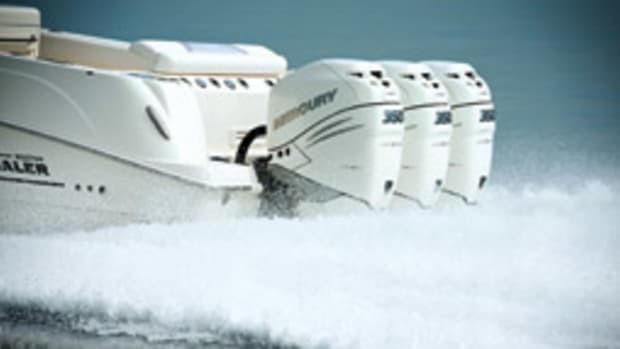 Case in point is the Intrepid 370 Cuddy, which has maximum horsepower capacity of 1,200. It has been powered with a variety of engine packages, including triple 275s, 300s and 350s, says Ken Clinton, president of Intrepid Powerboats. "For the person who wants to go fast and reach a certain amount of horsepower, they can now get to that number with twins instead of triples," Clinton says. The engines at the show were the first two prototypes. Davis expects production to begin in October, and he says Soundings and other media might have a chance to test the engines this summer. In addition to ZF Marine and General Motors, Seven Marine has partnered with Alfa Laval for the cooling system, Latham Marine for the hydraulic steering system and Hering Propellers. The engine will be available in 20-, 25- and 30-inch shaft lengths. It has a 150-amp alternator. Many boatbuilders are interested in hanging these engines, Davis says. Intrepid is a forward-thinking company, Clinton says, so it was pleased to be the builder Seven Marine approached. "We are very proud of the fact that we like to try new things and open the market to new ideas and give our customers more choices," he says. "We&apos;re a semicustom boatbuilder, and that allows customers to come to us and get what they want. When [Seven Marine] first came to us with the idea I was excited, but once I started to see the product and the plant, words can&apos;t describe how excited I was." The estimated retail price for the Seven 557 is $68,900. The company will back the engine with a 3-year warranty and a 10-year internal corrosion warranty. The engine will be sold directly to builders. For service, Seven Marine plans to place trained technicians at boatbuilders&apos; locations. 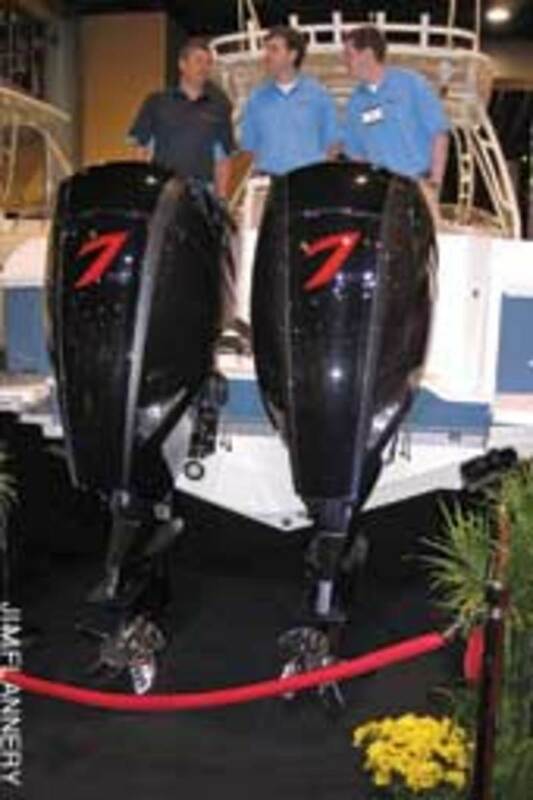 Contacts: Seven Marine, (877) 777-0330, www.seven-marine.com; Intrepid, (727) 548-1260, www.intrepidpowerboats.com; Alfa Laval, (866) 253-2528, www.alfalaval.com; ZF Marine, (954) 441-4040, www.zf.com; Hering Propellers, (360) 659-4315, www.heringpropellers.com.